The Mumbai headquartered company also overtook Japanese carmaker Honda to occupy the fourth spot in domestic passenger vehicle market. The last financial year (FY18) has been a year of Tata Motors in more ways than one. The country’s biggest commercial vehicle manufacturer has reclaimed leadership position in the light commercial vehicle (LCV) space from rival M&M after two years. Besides, the Mumbai headquartered company also overtook Japanese carmaker Honda to occupy the fourth spot in domestic passenger vehicle market. 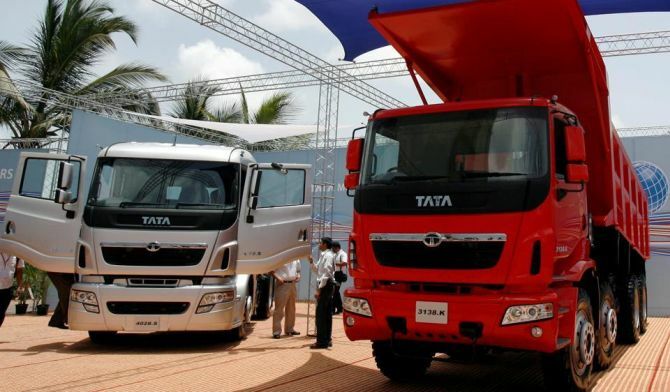 Making the most of a revival in demand for LCVs, Tata Motors closed the year with a 33 per cent jump in domestic sales. Sales of these vehicles jumped to a total of 208,443 units, the highest in recent years. This growth of 33 per cent is even better than the 31 per cent expansion clocked by the company's passenger vehicle segment. As far as the LCV segment is concerned, M&M did not do badly either. The automaker hits a growth rate of 20 per cent last fiscal year to sell 206,074 units. But it lost the lead of over 12,000 units it had gained over Tata Motors in FY16 riding on demand for its pick-ups. The lead in FY17 was even bigger at 16,000 units. But the situation stands reversed in FY18 with Tata enjoying a lead of over 2,300 units. Tata Motors introduced the XL series of Ace range of LCV and the Xenon Yodha in FY18, which has helped it gain market share. “The increased demand for vehicles across segments and production ramp-up of the new range of BS-IV vehicles has given a strong boost to sales. "We have strengthened our network and dealerships, across the country, to be able to service our customers better,” said a company spokesperson. LCV consists of goods carriers, passenger carriers and the former forms over 90 per cent of the segment. M&M remains a leader in the goods carrier segment though it is a much smaller player in passenger carriers. “At M&M, we are the leaders in goods category with a market share of 47 per cent. We achieved our highest ever annual sales in the goods segment in FY18, clocking almost 200,000 units and a 20 per cent growth," said Veejay Ram Nakra, chief of sales & marketing (automotive division), M&M. He said Mahindra had one of the widest LCV range to cater to the varied needs of cargo transportation. The company introduced a guaranteed resale value and two years of free maintenance on the Bolero pick-up and Maxitruck range in February, besides introducing the Supro heavy duty series of LCVs. It believes these will help it further expand the market share. Tata Motors is not ready to give up either. It plans to launch the Tata Intra LCV in FY19 with features such as powerful engine, improved ergonomics, high loading capacity, and air-conditioning. “We will continue to deliver superior value to the customers thus reducing the total cost of operation and improving revenue potential,” the spokesperson said. In passenger vehicles (PV), the company has outperformed the market with new products such as Tiago, Tigor, and Nexon. "We want to be among the top three brands in the customer's consideration set. "Going forward, with a well-defined PV strategy and robust product pipeline, we are confident of sustaining strong growth," the spokesperson added. Having overtaken Honda, it is eyeing the third position, now held by M&M. The expansion in volume and cost reduction initiatives helped Tata Motors post a profit during Q3 of FY18 after five consecutive loss-making quarters. Last week, Tata Group Chairman Emeritus Ratan Tata encouraged the Tata Motors team to plan for becoming leaders again. He said it hurt him when the automaker lost market share in the past 4-5 years and the country looked at it as a 'failing company'.